Ernest Miller is remembered on the Methodist Roll of Honour in Bottesford. He is also recorded in the Bottesford List of Absentee Voters, of 1918/19, as Corporal 18305, 4th K.O.S. Borderers, his home address at High Street, Bottesford. Ernest James Miller was born on 12 March, 1896, in Bottesford, the youngest child of James Ruddle Miller and Emma Miller, nee Jackson. James was born in 1851 at Hose, Leicestershire; Emma Miller was born in 1860 at Blackwell, Derbyshire. In 1901, the Millers had eight children: Mabel (aged 17), Emily (16), Frank (13), Caroline (11), Gertrude (8), Annie (8), Ida (6), and Earnest James (5). The family lived on the High Street, Bottesford, in the Georgian farmhouse known as ‘The Ferns’. James Miller was a poultry dealer and grazier, but by the early 1920s he was offering Good Accommodation and Refreshment Rooms for motorists and cyclists, and The Ferns was classed as a ‘Cyclists’ Harbour’. In 1911, the Miller family was still at The Ferns and James Miller was now recorded as a grazier. “Ernist Jas Miller”, aged 15, was no longer at home, but was living in Melton Mowbray, working as a butcher’s apprentice. He had accommodation at the home of his employer, Mrs Emma Morris, whose premises were at 35 Market Place, Melton Mowbray. The only service record that we have been able to find is that provided by Forces War Records website, which reports that Corporal Ernest James Miller, aged 19, of B Coy, 2nd Kings Own Scottish Borderers, was admitted on the 7th March, 1916, to what was probably a field hospital suffering from bronchial catarrh, and was treated at the “Divisional Rest Station”. In May, 1918, there were reports in the Grantham Journal that he had been severely wounded on the 21st April, 1918, and was undergoing treatment at Norfolk War Hospital. The report in the Journal of the 11th May provides some information about his service career. Ernest James Miller had enlisted in February 1915 and “proceeded” to France on the 20th July, 1915, joining the 2nd Battalion of the Kings Own Scottish Borderers, suggesting that there may have been a Scottish family background. 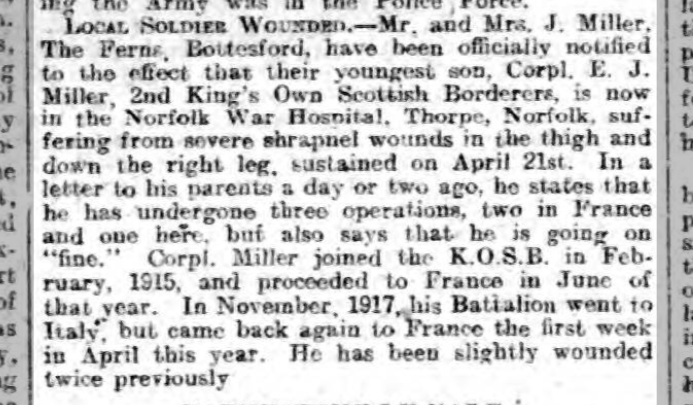 This report states that his parents, Mr and Mrs J Miller, had received official notification that their son Ernest James Miller, 2nd Kings Own Scottish Borderers, was in the Norfolk War Hospital, Thorpe, Norfolk, suffering from severe shrapnel wounds in the thigh and down the right leg, sustained on April 21. In a letter to his parents, he told them that he had undergone three operations, two in France and one after returning to England, but added that he was going on “fine”. He added that in November, 1917, his Battalion had gone to Italy but returned to France in April, 1918. He had been slightly wounded twice previously. 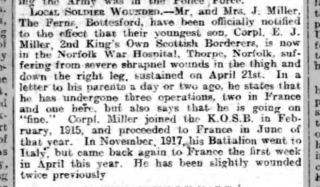 On the 18th May, 1918, the Grantham Journal confirmed the news that Corporal Miller was in Norfolk War Hospital, suffering from severe shrapnel wounds in the thigh and down the right leg. He was named in the Roll of Honour, 18th May, 1918. Ernest Miller was awarded the 1915-Star, The Victory Medal and the British War Medal. He was demobilized on the 26th January, 1919, and returned to live at Bottesford. However, he re-enlisted in 1925/26, and returned to the 1st Battalion, KOSB, as quarter-master, and appears to have stayed in the army at least until 1931. A summary of the history of the Kings Own Scottish Borderers during WW1 is given by Forces War Records. This points out that the 2nd K.O.S.B. fought in the Western Front throughout the war, save for a period from December 1917 to April 1918 when they were in Italy. In contrast, the 4th K.O.S.B. fought at Gallipoli and Palestine, only transferring to the Western Front in May, 1918. It is reasonable to conclude that Corporal Miller was on the Western Front and briefly in Italy from 1915 to April 1918. He had been treated for bronchial infection in 1916, and been wounded twice. Then on April 21st, 1918, he suffered severe shrapnel wounds, as reported by the Grantham Journal. After operations and treatment in France and England, he recovered sufficiently to return to France, and completed his military service with the 4th Battalion, K.O.S.B., which is where he was serving when the Absentee Voters List was compiled at the end of 1918. Electoral Rolls indicate that in Spring, 1923, James Ernest Miller lived on the High Street, Bottesford, with his parents James and Emma, and Edith Miller (perhaps a sister), probably at ‘The Ferns’ (The ‘Cyclists Harbour’). In the Spring of 1926, his address was still High Street, now listed along with Emma, his mother (his father had recently died). His new wife, Bridget, is not listed, and probably he was not resident either, having re-enlisted by this time. Ernest Miller married Bridget Easter Conboy in 1925. The marriage was conducted in the Roman Catholic Church while Ernest was a Sergeant in 1st Kings Own Scottish Borders based at Redford Barracks. He was 29 and she was 28. Bridget Easter Conboy was born in Haddington East Lothian in 1897. She was described as a shop assistant and it appears that she had been married before to a man called Kenilson. In the Electoral Roll for 1927, he is recorded in the Absentee Voters list, where his ‘Qualifying Premises’ is given as ‘The Walnuts’, Bottesford (now Walnut Farm). The roll provides additional information, describing him as 3178247 Quartermaster, 1st KOS Borderers. Electoral Rolls from 1929 and 1931 also give his address as ‘The Walnuts’, as the sole resident, implying that he was still absent in the army. Ernest Miller died on the 11th April, 1970, aged 74, in Bottesford. Bridget Miller died on the 25th April, 1975, aged 78 years, in Allington. They are buried with his parents, James and Emma, in Bottesford St Mary’s churchyard. James Miller died on the 30th January, 1925, aged 75, and Emma on the 25th August, 1936, aged 76. Rose from Corporal to RSM, KOSB by the end of hostilities in WW1. Re-enlisted 1925 as Quarter-Master, 1st KOSB. Thankyou for the interesting facts about my grandfather. I do have a postcard from him when he was one of the officers on board the Somersetshire in 1933 taking troops to India and Africa. He married my grandmother in 1925, her stepfather’s name was Renilson so I suggest that is the name on the marriage certificate. In 1928 my mother was born in Aldershot barracks and likewise my aunt in 1930. 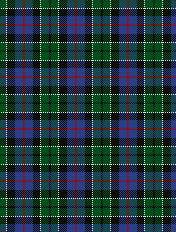 My Aunt Joan was born in 1932 in Inverarie where he was stationed and I believe he stayed in the KOSB until he retired and moved into 3 Grantham Road. He then took a job serving petrol at the garage just down the road from the house until moving to Grandby Drive. One other interesting fact is that the Edith you mention living with the family in 1923 could be Edith Wells who was brought up by Ernest’s brother Jackson.